NOTICE: 2018 NC Residential Code Book will be included on the NC Plumbing Exam as of January 2019. You can now order this book through our website and will be covered in our foregoing Plumbing workshops. Repeal of Mandatory Continuing Education...click here to learn more! Grady Harlow, Inc., has been helping professionals prepare for the State of North Carolina licensing exams since 1973. Along with more than 44 years experience in plumbing, electrical and general construction, GHI has helped thousands of candidates prepare and pass the NC licensing exams. You must know the material now More Than Ever. Each workshop reviews the applicable code book sections and presents essential information with over 300 copyrighted slides. High-lighting is NOT our only form of information! There are questions and answer sessions as well as other reference materials. Our goal is to better prepare you for the State of North Carolina examination of your choice. Required for class: Hi-lighters, calculator, paper & required books for exam. Hotel Discounts: If you are needing a hotel reservation, please contact the hotel directly and notify the staff that you are a student with Grady Harlow inorder to receive your discount. Over 300 orginal copyrighted slides for the presentation to help understand the code text, covering mathematics, theory, intense drainage and vents. If you're in the Plumbing or HVAC business, you may need this license to better (and legally) disconnect the wiring of the equipment. This Electrical License allows the SP-PH contractors to perform electrical work for the plumbing & HVAC change outs. Covered material includes code text, load calculations and all other aspects of referenced text for the exam. Classes are 2 days of instruction with workbook guidance. Contact our office for more dates and locations. Michael’s career path began at age 9, when he started helping his father, Grady Harlow, with the construction of single family homes. 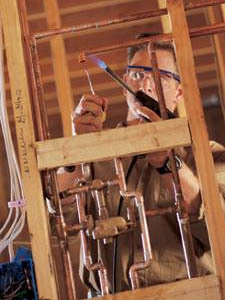 At age 17 he attended his father’s Plumbing Workshop in preparation for his plumbing license. Michael became the youngest in the state of North Carolina to hold a North Carolina Class I Plumbing license. Copyright 2011 Home - Grady Harlow Inc. | Code Seminars & Training. All Rights Reserved.